after 7pm there is a fee for late check in of euro 10 a person. Non smoking. fees will be applied to those who transgress. REMENBER TO COMUNICATE YOUR ARRIVAL TIME. Please communicate your arrival time.We do not live there and the reception is open only in the morning, so we need exact arrival details to ensure the check in. If you need any assistance during your arrival or staying in Florence feel free to contact us. Panzani 14 TouristHouse located a few steps from the Santa Maria Novella station (SMN) and the most famous monuments of Florence; welcomes our customers in a family atmosphere at home, with rooms of different types. The historic center of Florence, a UNESCO World Heritage Site, is home to many masterpieces of Renaissance art and architecture. One of the most famous places is the Duomo, the cathedral with a tiled dome designed by Brunelleschi and Giotto's bell tower. The Accademia Gallery exhibits the sculpture of Michelangelo's David while in the Uffizi Gallery there are Botticelli's Birth of Venus and the Annunciation by Leonardo da Vinci. An open-air history book, ready to be read by our guests. 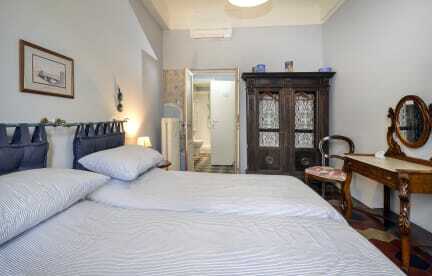 Just cross the door of 'Panzani 14 Tourist House' to find yourself immersed in the history and beauty of Florence. Our rooms, from the simplest with shared bathroom to those with private bathroom and family rooms, are perfect for a stay in beautiful Florence. Savor all the freedom to experience the city at your own pace. Breakfast service is not provided. We recommend that you indicate your arrival time. CANCELLATION POLICY: 48 hour before arrival. The Panzani 14 TouristHouse is managed by the owners, who will consider you as special guests, making you feel at home: they will take care of you advising you the best places and events not to be missed, but above all they will help you live the city not simple tourist.